Simply fill out the form below or contact us. For 40 years, our community has generously supported us and has helped shape our mission – to celebrate the lives we are privileged to touch. We honor each person and celebrate each unique story. To celebrate our 40th year, we invite you to be part of our story. Are you a family member who has a story of celebrating life with your loved one in our care? A former staff member who has memories to share about the beginnings of our organization? Perhaps you are a Volunteer with us and want to share a story about the passion you’ve experienced serving our patients and families. 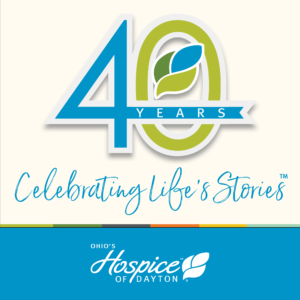 So dust off your photo albums and search your closet for any precious treasures you may have about the Ohio’s Hospice of Dayton 40-year journey. You are a part of our story! Additionally, you can upload a Word document or PDF file here. The file size is limited to 2mb. If you would like to some images to go with your story please add them here. We can accept up to two images per story submission. These images are limited to 2mb in size each and can be JPG, GIF, or PNG files. When sending your stories and images please be aware and considerate of medical privacy for anyone featured in your photos. Please know that we may feature the stories you share on our websites or publications with the purpose of sharing our story or helping to strengthen others. By submitting your information here, you grant us the ability to do so.